The following is a summary of the last four Oakland Township Board meetings. There have not been any controversial issues that have either been brought up, or created, by the Board over the past few months. Unanimously approved a request to obtain input from the MDEQ as to their position on the Mill Race restoration possibilities. Unanimously approved payment of $9,000 to PEA for engineering services on the Millrace project. Approved in a 5 to 2 vote (Reilly and Langlois the dissenting votes) the expenditures necessary to develop maintenance and repair project for the existing safety path surrounding Oakland Christian Church and construction of a new path surrounding the Blossom Ridge development. It also approved authorizing the Safety Paths and Trails Committee to oversee the project. The Safety Paths and Trails millage would fund the work. Unanimously approved entering into a contract with the Neighborhood House to provide transportation services for low to moderate income citizens of Oakland Township, utilizing Community Development Block Grant funds appropriated to the Township. Unanimously approved awarding a $6,400 contract to Cornerstone Remodeling Company LLC, for the painting of the Cranberry Lake Farm hen house and hatchling house. Approved in a 6 to 1 vote (Langlois the dissenting vote) a motion to not entertain discussion on the 45 MPH postings on Mead and Dutton Roads with Rochester Hills. Unanimously approved a request for a two-year extension of the Oak Arbor PRD. Unanimously approved the Water supply and Amended Sewage Disposal rate increases for the residents serviced by the Water Resource Commission (click on image to enlarge). Approved in a 6 to 1 vote (Giannangeli the dissenting vote) the expenditure of $17,085 for the replacement of the flat roof on the east side of the Paint Creek Cider Mill canopy roof. Unanimously approved awarding a contract for $20,499 to the E. L. Electrical Company for replacing the Paint Creek Cider Mill electrical transfer switch. Unanimously approved purchasing a truck and trailer for our Fire Department for $31,948 and $5,865 respectively. Approved in a 6 to 1 vote (Mangiapani the dissenting vote) the deferred increases in the Parks and Recreation Employee’s compensation, pending the Parks and Recreation Commission’s approval. Unanimously approved purchasing a 40-foot flagpole for the Cranberry Lake facility owned by the Township for between $2,175 and $2,225. Unanimously approved the purchase of a Building Department Vehicle for $52,415. Unanimously approve the leasing of a Chevrolet Traverse for general Township use at a cost of $315 per month. Unanimously approved the Buell Road Ventures request to direct their proposed special land use Ultimate Paved Road density, for 16 units on the South side of Buell Road between Rochester Road and Hadden Roads, to the Planning Commission for their consideration and review of the proposed plan. Unanimously approved Verizon Metro’s request to add underground fiber optics capability within the approved right of way within a portion of our Township. Approved in a 6 to 1 vote (Giannangeli the dissenting vote) the extension of the Oakland Township firefighter’s contract for one year, but with a 2% increase in compensation. Approved in a 4 to 3 vote (Giannangeli, Mangiapani & Ferriolo the dissenting votes) the authorization to contribute $6,522.18 to the Rochester Area Youth Assistance program. Things have appeared to ‘settle down’ with our newly elected Township Board. This entry was posted in Uncategorized on June 30, 2017 by richardjmichalski. 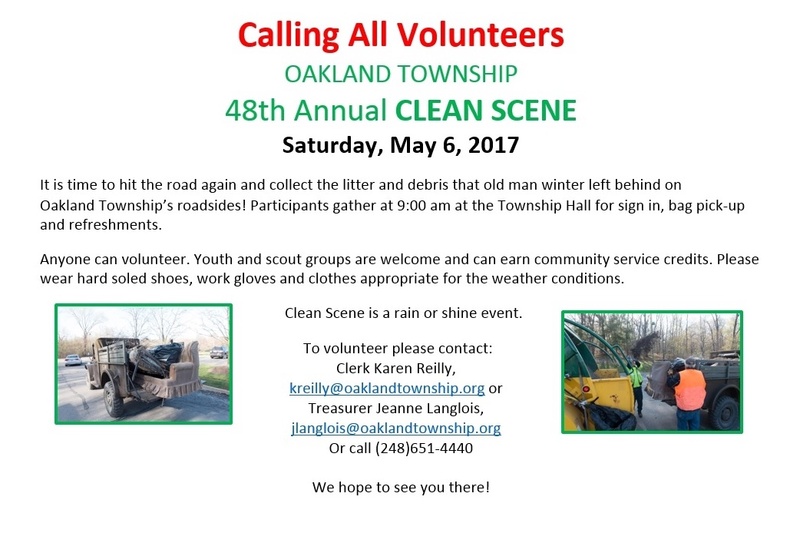 In the spring of each year, Oakland Township sponsors an event that benefits all of our residents. That event is the ‘Clean Scene’ event. During this one day event, volunteers from the Township, as well as other concerned citizens, offer their services in picking up the clutter that is along the roads in our Township. It is a great way to help the community, get some exercise, and meet some of our fellow citizens. This year’s event is scheduled for this Saturday, May 6 , 2017. The volunteers will meet at 9AM at the Township Hall on Collins Road . Anyone can volunteer. Please wear hard soled shoes, work gloves and clothes appropriate for the weather conditions. Here is a flier advertising the event (click on image to enlarge)! This entry was posted in Uncategorized on April 30, 2017 by richardjmichalski. Oakland Township is blessed with a ‘rural’ atmosphere. That appeal is made possible, in part, because many of our roads are not paved. Unpaved gravel roads however deteriorate rapidly under various weather conditions and high traffic counts. In a recent Township wide survey, our Township residents made is clear that we love the rural atmosphere, but we are not satisfied with the quality of our gravel roads. The Township Board took steps at the April 25, 2017 board meeting to respond to the wishes of our residents. The Township Board had previously established a Road subcommittee to develop an organized approach to deal with the road issues in our Township. The members of the subcommittee include Trustee Robin Buxar, Trustee Frank Ferriolo, and Clerk Karen Reilly. 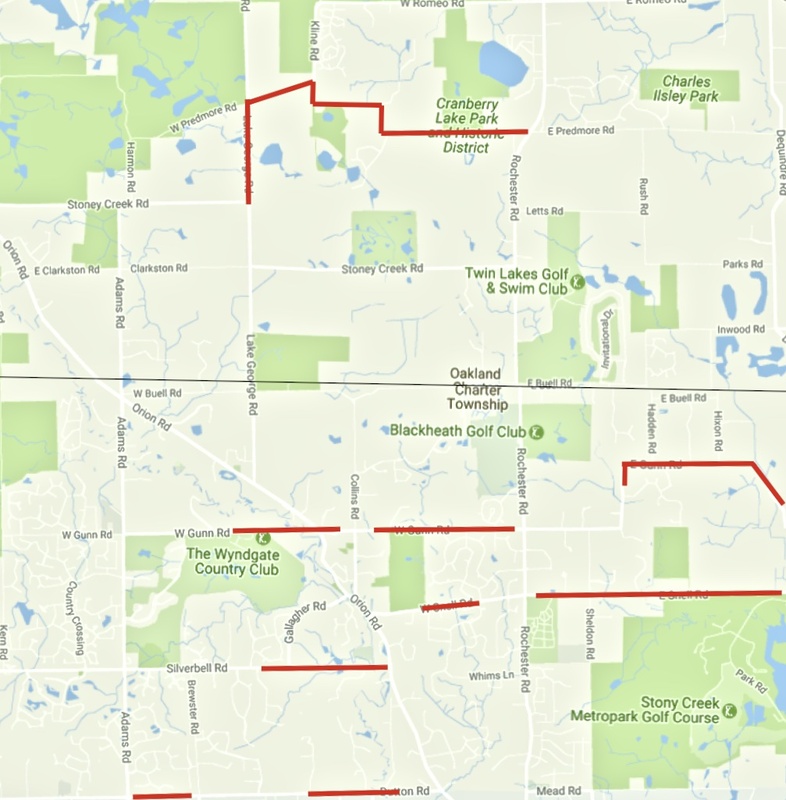 The responsibility for maintaining the roads in our Township is the Oakland County Road Commission’s. As with statewide road improvements, funding is very limited. Up until recently, the only source of funds for road improvements were ‘Tri-Party’ funds. The Tri-Party fund receives money from the State, the County, and local communities. The cost is shared equally among all three. The Road Commission ultimately makes the decision which roads will get improvements, but they rely very heavily on input from the community. The subcommittee provided a structure methodical approach to identifying Oakland Township’s highest needs. In 2016, the Township Board made a somewhat controversial decision to subsidize additional road improvement above and beyond what the Tri-Party fund would cover. The 2016 Tri-Pary funding was $125,092 ($41,697 from Oakland Township). The Board approved spending an additional $68,421 for road improvements. The total cost to the Township was $110,121. The total cost to cover all three items is $230,664 ($84,508 from the State and County). The total cost to the Township will be approximately $146,000. 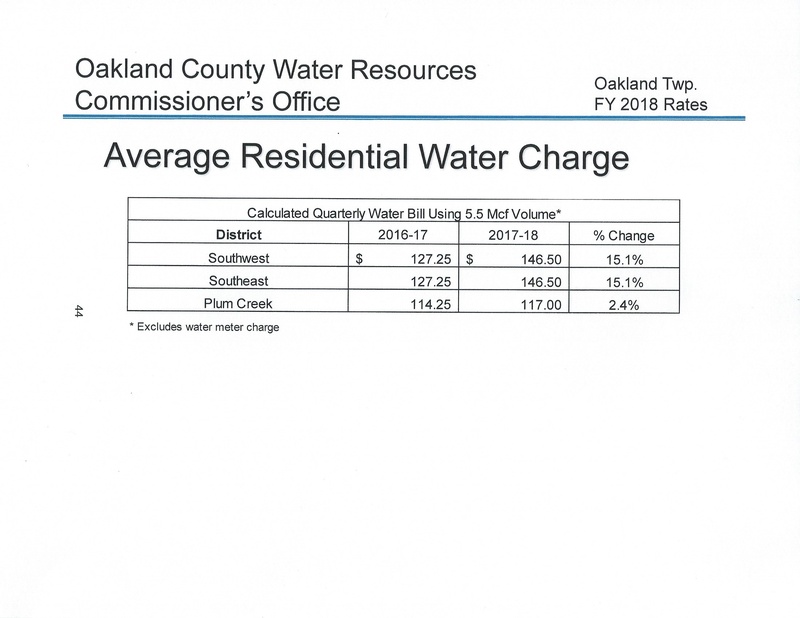 Why is this important to the citizens of Oakland Township? Road maintenance and improvement are the responsibility of the Road Commission. Trustee Ferriolo determined that about 50% of Oakland County communities subsidize road improvements above the Tri-Party levels. The decision by the Township Board to spend an additional $104,000 over our obligated Tri-Party amount was based on the residents’ response to the recent survey, where we indicated we were not satisfied with our Township roads. The Board has made an attempt at improving the situation. We all need to be aware of the work that will be done on our roads this summer, and need to monitor the quality of the roads to determine if we notice a significant improvement from previous years. Our feedback will influence the plan for 2018. This entry was posted in Uncategorized on April 26, 2017 by richardjmichalski. 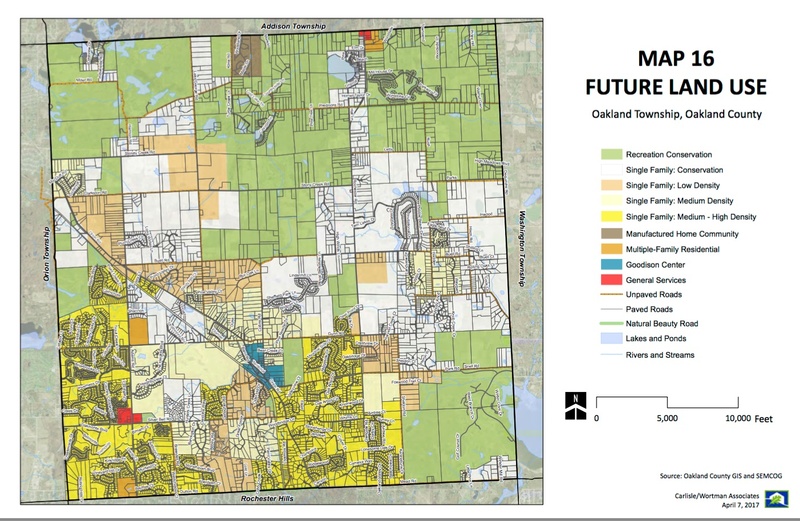 The Board approved a Safety Path and Trails strategy plan that will be an appendix to the, yet unapproved, Oakland Township Master Plan. The Board approved the appointment of Libby Dwyer to the Safety Path and Trail committee for a three year period. 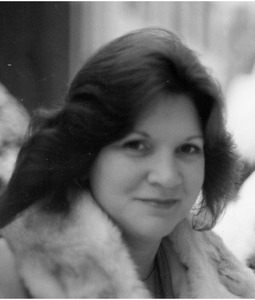 Libby has been the chairperson for the Safety Path and Trails committee for the past few years. The Board approved the appointment of two Historic District Commission members: Gene Ferrera and Donald Westphal. 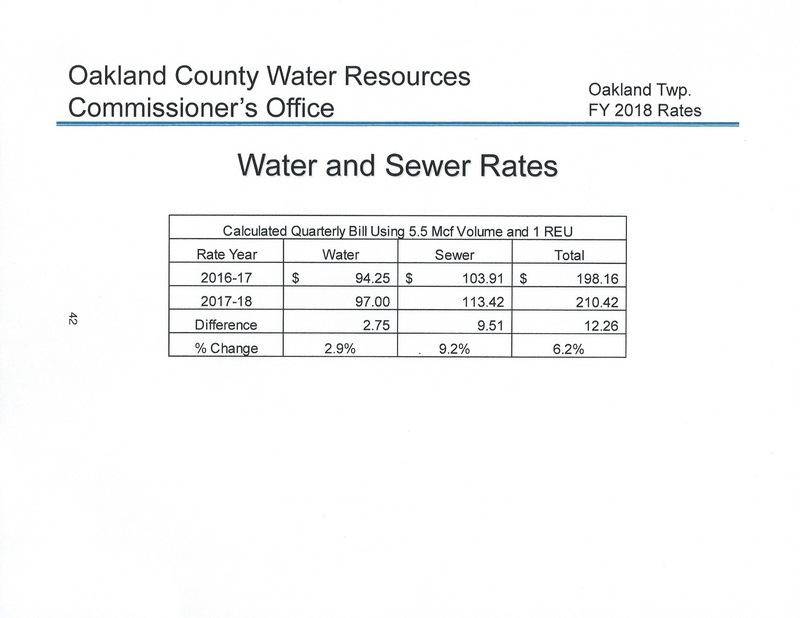 The Board approved a prepayment of Oakland Township’s share (approximately $525,000) for improvements to the Water Resource Commission’s sewage sludge treatment. They could have chosen to fund the project through a bond proposal. Since the cash is currently available in the Township’s accounts, it made more sense to them to make the payment now and eliminate the higher interest expense associated with the bonds. The Bond interest would be a higher rate than what the Township is currently making on the money in our accounts. The Board approved a proposal (which was developed by the Board’s road sub-committee) that identified the roads that would be serviced by the Road Commission’s Tri-Party fund. The proposal also included several additional road improvement items that would be solely funded by the Township. A SEPARATE POST WILL BE MADE WITH THE DETAILS OF THIS PROPOSAL. The Board approved retaining our Township’s current Liability insurance company. The Board approved a contract for the Landscaping services of our Township properties.